Fusion reactors could become an economically viable means of generating electricity within a few decades, replacing conventional nuclear power stations, according to new research at Durham University and Culham Centre for Fusion Energy in Oxfordshire, U.K. The research, published in the journal Fusion Engineering and Design, builds on earlier findings that a fusion power plant could generate electricity at a price similar to that of a fission plant and identifies new advantages in using new superconductor technology. Such findings support the possibility that, within a generation or two, fusion reactors could offer an almost unlimited supply of energy without contributing to global warming or producing hazardous products on a significant scale. Fusion reactors generate electricity by heating plasma to around 100 million degrees centigrade so that hydrogen atoms fuse together, releasing energy. Fission reactors work by splitting atoms at much lower temperatures. The advantage of fusion reactors is that they create almost no radioactive waste and high-level radioactive material to potentially leak into the environment. That means disasters like Chernobyl or Fukushima are impossible because plasma simply fizzles out if it escapes. Fusion energy would also not produce weapons-grade products that proliferate nuclear arms. It is fueled by deuterium (“heavy water”), which is extracted from seawater, and tritium, which is created within the reactor, so there is no problem with security of supply either. 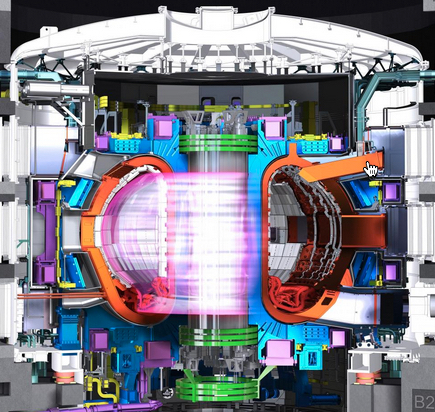 A test fusion reactor based a tokamak design, the International Thermonuclear Experimental Reactor (ITER), is about 10 years away from operation in the South of France. Its aim is to prove the scientific and technological feasibility of fusion energy. MIT also plans to create new lower-cost, compact version of a tokamak fusion reactor, also based on improved superconductors, which are required to produce the high current needed to produce magnetic fields. “Fission, fusion, or fossil fuels are the only practical options for reliable large-scale base-load energy sources,” said Professor Damian Hampshire, of the Centre for Material Physics at Durham University, who led the study. “Calculating the cost of a fusion reactor is complex, given the variations in the cost of raw materials and exchange rates. However, this work is a big step in the right direction” he said. The potential for reducing the Cost of Electricity (CoE) by using High Temperature Superconductors (HTS) in the Toroidal Field (TF) coils of a fusion tokamak power plant has been investigated using a new HTS module in the PROCESS systems code. We report the CoE and the design of HTS tokamaks that have been optimised by minimising the major radius of the plasma. Potential future improvements in both the superconducting properties and the structural materials for TF coils operating at 4.8 K and 30 K are considered. Increasing the critical current density by a factor of 10 (with a commensurate reduction in costs kA−1 m−1) results in a CoE 4.4% less than equivalent tokamaks using current low temperature superconductors (LTS). If the yield strength of the TF casing material is increased by 40% to 1400 MPa, the CoE is further reduced by 3.4%. Implementing both improvements and operating the TF coils at 4.8 K leads to CoE of 19.1 (10.1) €cent kW−1 h−1 for a 500 MW (1.5 GW) HTS reactor compared to 20.7 (11.1) €cent kW−1 h−1 for an LTS reactor (2013 costs). Operating the HTS TF coils at 30 K with both improvements, gives a similar CoE for HTS and LTS tokamaks.